1 edition of Mélyvízi hal found in the catalog. Add another edition? Are you sure you want to remove Mélyvízi hal from your list? 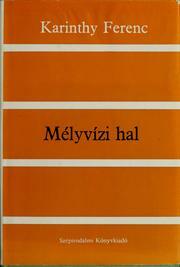 Published 1982 by Szépirodalmi Könyvkiadó in [Budapest] . 347 p.,  leaf of plates : port. ; 19 cm.